The two events are not related. They’re only related in my mind. Maui finally got a Target last week and native Hawaiians formally marched around Maui to raise cultural awareness at the end of Makahiki season (Hawaiian New Year). They didn’t consult each other. The native Hawaiians didn’t look at retail reports and the Target executives didn’t study the Hawaiian moon calendar to plan their events. But both oddly significant events happened at the same time. participate in a torch-led march around Maui. 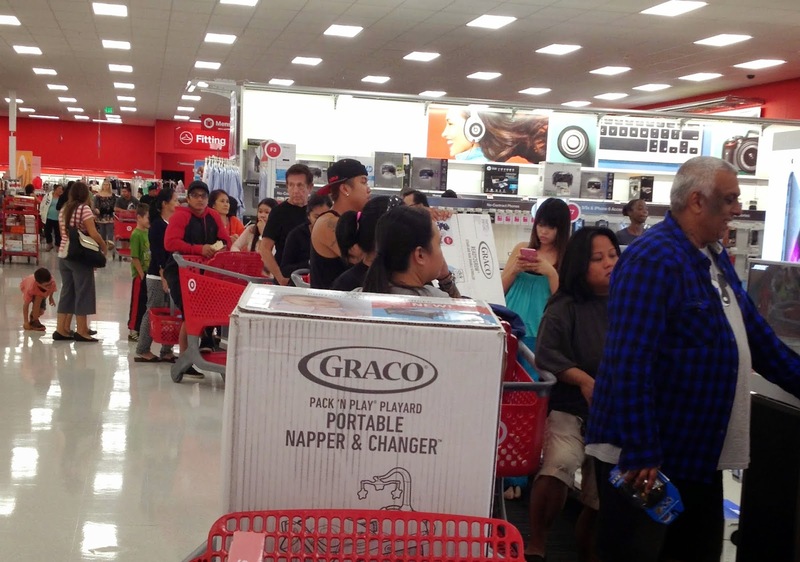 Why would Target's opening be a significant event on Maui? Because Maui doesn’t have a lot of big box stores. We have Wal-mart, Kmart, Macy’s, Sears, Costco, Lowe’s, Home Depot, Sports Authority, Barnes & Noble, and Ross. There are some swanky stores at The Shops of Wailea and at the Outlets of Lahaina. Soon there will be a TJ Maxx at the Maui Mall. There’s even a Whole Foods. Some of my friends are sad about Target’s opening, because it represents Maui becoming more like the mainland, with another mainland store. 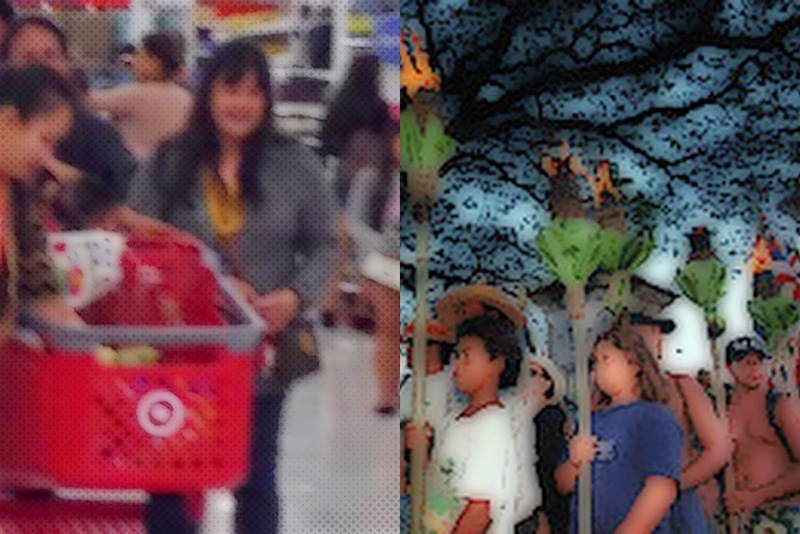 I suspect the people who are most distressed about Target are the ones who moved to Maui to escape suburban sprawl. They had their fill of big box stores and are simplifying their lives, downsizing, living on Maui, trying to shop local. But it’s really hard to shop local on Maui when local stores don’t always carry what you need, or the prices are sky high because there’s not much competition and you’re living on low wages. There are also people who don’t want more malls on Maui but are secret Amazon junkies. Confession: I adore Mana Foods, our north shore health food store/grocery store, but secretly crave Trader Joe’s. Crowded aisles of Target filled with families. We checked out Target. Surprisingly it didn’t take 4 years to build. The Target people must have paid extra to have quicker construction than is normal for this island. The aisles were full of families with small children and their aunties, uncles, parents, grandparents, and cousins. We even saw a Tibetan monk in orange robes. Hardly any tourists and not a lot of Caucasians either. I could be at the Maui Fair, except it was in Target, or Tarzhay. I bet most of these people had never been in a Target before. Looked like some of them even brought their high school dates along. At the same time as Target opened, native Hawaiians marched for unity around the island of Maui last week. The last time they marched around the island, a 200 mile journey that takes a week, was in 2009. The ka’apuni (circle island march) was planned for the end of the Hawaiian New Year, with a visit to each traditional Hawaiian district of the island, called a moku. My understanding is that this torch-lit circle-march was held every year in the days of old Hawaii and is nonstop, like the Olympic Torch Relay. I think it’s a really important event, though I didn’t participate in it. Walking by foot to visit each traditional Hawaiian district of the island is the opposite of our dominant culture, where speed, efficiency, and concrete results are prized. My impression from what little I know about the march is that it was about paying respect to the ancestors and reconnecting with the land, literally step by step. Last year at the Maui Arts & Cultural Center, a powerful film called Dakota 38 was shown, about a prayer ride in the middle of winter to honor Native Americans who were tragically killed. This event is in the same category for me, a prayer walk of reverence. It makes me think of pilgrims and other seekers who for centuries have walked the road to Santiago across Northern Spain, except this pilgrimage is in my back yard. I would have liked to have participated in the walk, even if it only meant meeting the walkers as they reached my district. That didn’t happen because I didn’t find out ahead of time when they would be coming through my moku and I was not willing to stand on the side of the highway for three days, wondering, or driving 80 miles to meet them en route. It’s not the fault of the organizers. I did not prioritize finding out their schedule ahead of time to meet them and so I did not get updated. I wondered about the logistics of keeping their phones charged so they could send text messages or update their Facebook page. I wondered if they blocked cars behind them, or if people honked at them, in protest or in support. They walked during one of the wettest weeks on Maui this winter, after days of hot “summer” weather in January and February. Whether or not I participated isn’t really important. What’s significant is that the event existed at all. In a world where it’s hard enough to get a bunch of people together for a meeting or an event, it’s really amazing to get a number of people together to physically exert themselves and take a week out of their lives to do something that does not translate into dollars and cents. Something that is not as tangible and easy as going shopping. 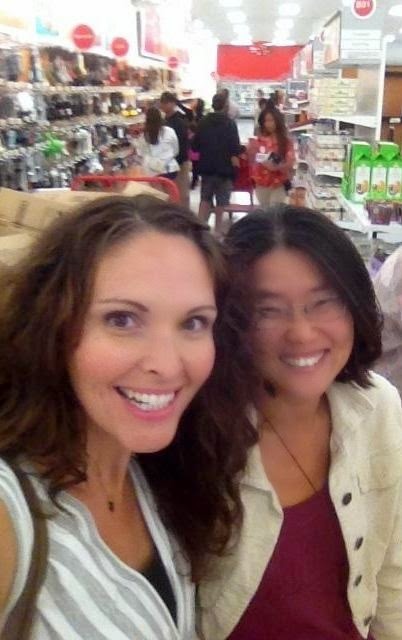 It was fun running into you at Target! I went back today & saw two more friends :) small island. You too! You take much better selfies than I do! You could've been writing about my town, Courtney. Target is the big store for now. Many people want big box stores and restaurants which they say will have them shop and eat here rather than out of county where they work. I have my doubts about that. It drives me nuts that people move here because they can buy affordable homes in a place with a less hectic pace, yet they want the convenience of the big box stores and such from which they moved away.